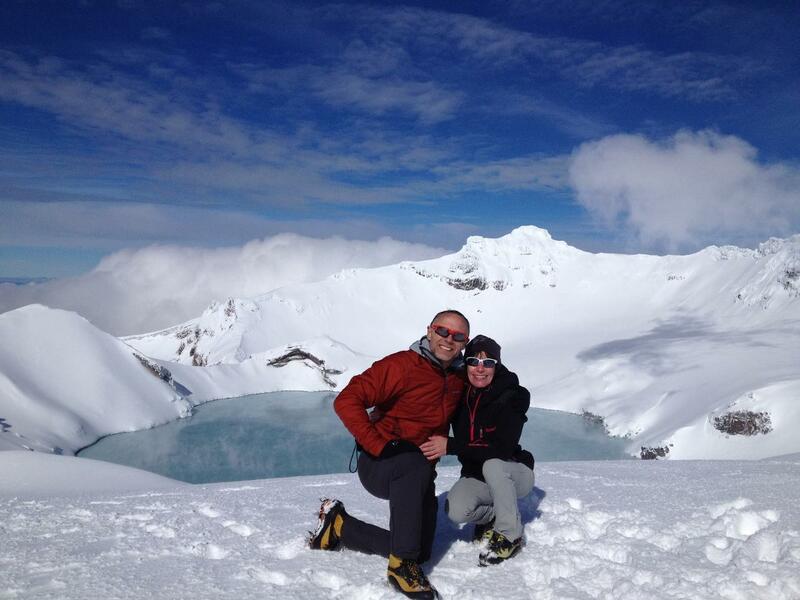 For those who like a manageable challenge, we offer a full day Ruapehu Guided Walk. Mt. Ruapehu is the highest (2797m) of the three active andesitic volcanoes in the Tongariro National Park. The last eruption on Mt. Ruapehu was in 2007. Join us for lunch on top of the North Island highest volcano from where you can gaze down into the geothermal waters of the crater lake. Please note this is not a track and is less stable walking than on the Tongariro Alpine Crossing. The walk begins at the Whakapapa Ski area at the top of the Bruce Road on Mt. Ruapehu. There may be an option of taking a chairlift up to Knoll Ridge cafe. This option will depend on the group on the day and if the chairlifts are operating. Payment for the chairlift is about $35 pp and is made to Ruapehu Alpine Lifts (situated at the start of the walk). The lifts close at 4.00 pm daily, should conditions deteriorate during the day the lifts may have to be closed earlier. Guide/s, transport between the Adrift Tongariro base and the activity, lunch (vegetarian available on request at time of booking), crampons and ice axes if required for winter conditions, $40 of clothing and footwear hire (boots $20, clothing $10 per item). Please note this is not a track and is less stable walking than on the Tongariro Alpine Crossing. Walking distance is 10 kms return or 7 kms return when the chairlift is utilised. Walking time is about 6-7 hours. This walk requires a good level of fitness. The terrain is uneven and steep in places. It is possible to take the walk as far as Knoll Ridge Cafe if you are concerned about your fitness. During winter and times of snow, surface conditions will vary from day to day. Crampons and ice axes are required, and your guide will provide instruction on how to use them correctly.